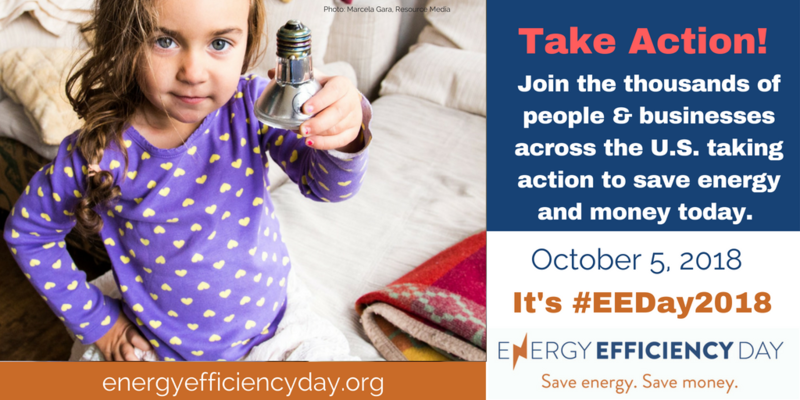 Friday, October 5, 2018, marks the third annual Energy Efficiency Day, #EEDAY2018, which showcases the benefits, methods, and successes of efficiency programs across the nation. Energy Efficiency Day is recognized by a network of efficiency advocates throughout the industry, including government agencies, scientists, utility companies, non-profits, contractors, and more. Energy Efficiency Day not only aligns with the principles of HPC, but it also highlights our method of efficiency. We advocate for home energy efficiency performance from a whole home approach to create long-term sustainability for overall health and comfort. Energy Efficiency Day brings focus to the entire industry and highlights the importance of all parties across all levels participating in the advancement of efficiency. It takes stakeholders at all levels to make change in energy efficiency. Contractors, like-minded organizations, online communities, building scientists, green building professionals, weatherization contractors, program implementors at the state and local government level, energy consultants, and more work together for a common goal. Energy Efficiency Day celebrates these stakeholders throughout the industry for their contributions year-round in the advancement of energy efficiency. From implementing research-based government policies to local contractors understanding how to incorporate an energy efficient system into an existing home, only a whole-industry approach works to systemically impact global energy consumption. In 2017, over 300 stakeholder organizations participated in Energy Efficiency Day. These participants included local city governments, corporations, small businesses, civic groups, non-profits, and universities. The diversity represented demonstrates the breadth of the energy efficiency movement. The focus on energy efficiency has reverberated throughout our economy. One of the biggest impacts is positive job creation. Energy Efficiency Day participant and HPC partner, E4TheFuture, spreads awareness through their Faces of EE campaign. EE pros are often too busy carrying out their work to talk about its value, and that’s where Faces of EE comes in. Their mission involves spreading the word about how important the energy efficiency industry is to America’s economy while promoting solutions that make the EE sector even stronger. More than 2.25 million energy efficiency pros work in the United States. Faces of EE seeks to humanize that statistic and showcase professionals from all 50 states. At HPC we celebrate Energy Efficiency Day as part of our overall mission. We educate the residential energy efficiency workforce, to equip them to do their jobs better so that homeowners and tenants save on energy usage and costs. We offer the industry’s leading educational events through conferences, workshops, and training in partnerships with the nation’s leading experts in home performance and weatherization. Join us October 5, 2018, as we bring awareness to the people, process, and products that produce energy efficiency by celebrating and promoting Energy Efficiency Day, #EEDAY18. We can all do our part to advance energy efficiency. Visit www.energyefficiencyday.org to register your company and receive more information and ideas. It is so important that lawmakers hear directly from you – the industry backbone and job creators! HPC filed comments because all four utilities did not “seem to include an assessment of jobs created as a non-energy benefit..."
Advocacy Matters! Join us for Contractor Lobby Day 2018. Once lawmakers understand the value of the home performance industry, they will fight for us like Senator Van Hollen did in 2017!